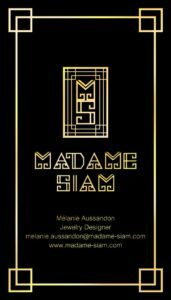 Client: MADAME SIAM is a jewelry designer creating original, singular and sophisticated pieces. Using semi-precious stones and mounts, they manage to combine a bohemian spirit with elegance. Their creations are easy to wear while being glamorous. 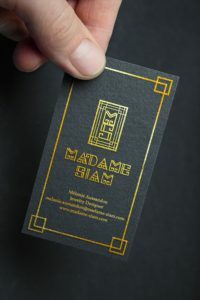 After the creation of their logo, Madame Siam came back to us for business cards. A great logo or visual identity is more than just images and words. It tells who you are, what you do and what you stand for at a glance. Before any graphic design work, we brainstorm with you, discuss and exchange points of view in order to bring life to your ideas. Then we start the design part and make several propositions. Once the final design is approved, we deliver files in all format you might need, with all associated information (font, color, etc.). Created in 2014 in Bangkok, Suzaku Productions is a French web agency offering web design and development, graphic design, photo and video shooting. Whatever your project, we will find the best solution for you.